Bloody Beer is a lighter bodied beer with an appealing ruby red glow. Fermented with Roma tomatoes, and spiced with dill, horseradish, peppercorns and celery seed, a prominent aroma of spicy tomato juice emits from the beer. The intense initial tomato flavor is followed by a lingering finish that allows each additional ingredient a chance to resonate on the palate. When slightly warm, this 2009 Great American Beer Festival silver medal winner’s magnitude of flavors can be fully appreciated. 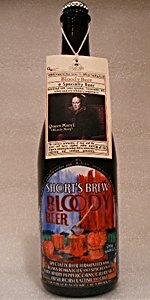 Bloody Beer was beer number 8 of 13 from our 2007 Imperial Beer Series and it was the 290th batch of beer ever brewed at Short’s. It matches the style so I can't ratw it too low but I'm not a fan of Bloody Marys. Pour is orangish red. Short, foamy, off-white head that is short-lived. It smells tomato, pepper, Citrus, celery and Bloody Mary mix. Taste basically like a bloody mary the kind that's mixed with beer. Finishes dry with a tomato linger. Medium body and fizzy medium carbonation. I like bloodies, but this was so-so. I was hoping for more spice. It reminds me of a watered-down V8. For what it is its not bad. A bloody Mary beer? Shorts did a hell of a job. Smells like tomato soup with flavors of horseradish, dill, tomato, and malt. First beer ever had that tastes better with a pickle and a few drops of hot sauce. I highly recommend adding the pickle and got sauce. Near spot-on. I wasn't sure how much I would enjoy this one since Bloody Mary's - and tomato juice in general - is something that I have to be in a specific mood to enjoy. I don't think ive ever craved after it. After having a few I've discovered that it's the texture of Bloody Mary's that I have difficulty with. Poured from bottle to goblet. Color is that of raspberry jam with a collar of off white foam. Head quickly dissolves, leaving a clean glass. Aromas of spice: celery seed, pepper, dill, all riding a wave of savory/sweet tomatoes. Flavor is tomato forward, with dill and celery upfront and a peppery/horseradish finish. Spicy without becoming too hot. Thin feel. As a huge fan of Bloody Marys and beer... this is just gross. Appearance - The beer poured a copper color with a white head. Smell - The beer had a salty Bloody Mary-like nose. Celery is also fairly evident. Taste - The overall profile makes me think of a rye beer. I get celery salt, tomato, and char. There is something that reminds me of vodka. The horseradish or any sense of spice are not evident. Mouthfeel - Carbonation was pretty straight forward like an average pale ale. Overall - I wonder if I add a pickle or celery stick if this would improve. Perhaps adding Bloody Mary mix would help. i have been a longtime critic of the overly flavored beers, found them gimmicky and havent been shy about saying so. this though, goes beyond that into such a weird space i dont even know where to begin. for one, its wholly unique and special, tastes wonderful, and like it or not, is about as well done as such a thing can be, like a bloody mary on a hangover with a nice beer back of pale or blonde ale. the beer is light as a beer, minimally malty or strong flavored or anything, but brewed with all the necessary components of the famous cocktail, including things like roma tomatoes and celery seed and horseradish! there is so much going on here in the taste, its herbal for one, lots of tomato puree flavor, black pepper, a little spice to it, even celery flavor, its crazy. gnarly strong too, brings you right back, sneaky strong. im not sure id want to make a day of drinking this, but its much more than a novelty and frankly not a gimmick at all. shorts seems to do these crazy flavored beers better than anyone, and i have come full circle from disdain and scorn to admiration and stoke on pretty much their whole range of them, but this is far and away my favorite. as good as it could possibly be, nothing offensive about it at all despite all the weird ingredients, definitely not an easy beer to pull off, but this is super well executed! wanting a stash of it for those hungover sunday mornings! Let me also add that I do not enjoy drinking any liquor at all.. and have never had an actual bloody mary ... ever. Well.... maybe a sip and a EW WTF face followed........... hmmm .. Pours a light red/orange with minimum head n little lacing. Nice. Taste is tomato... spice..peppercorn... light hop presence... can even pick up the dill / celery a bit which is awesome! Not overpowering.. just there.. how cool. The horseradish actually adds a bit of spice also in the mix... a little nose stinging is there on the initial taste. Mouthfeel is surprisingly good. Not watery like expected. Spice and tomato... peppercorn... mmm.